Days filled with back-to-back meetings usually don’t leave much time for proper nutrition, but Daniel Lubetzky is here to change that. His company, KIND Healthy Snacks, sells snack bars that consist of whole foods and no preservatives. “Do the kind thing for your body, your taste buds and your world” is the company’s motto, which speaks to its larger mission to be kind in general. When Lubetzky founded the company in 2004, he also established the KIND Movement, an initiative to fund projects that help make the world a better place. Today the movement donates $10,000 per month to community projects and allows website visitors to vote on which project to fund. This altruistic push is not a surprise for anyone who knows Lubetzky. The 40-something visionary grew up with a father who lived through the Holocaust, spent time in the Dachau concentration camp and had his life saved by a merciful soldier who gave him a potato to eat. “What is remarkable is that he was able to recall all that darkness and yet stay positive and highlight instances of kindness amidst some of the saddest chapters in human history,” Lubetzky says. His father immigrated to Mexico and started a family after the war, but never forgot the generosity that soldier showed him. He instilled the concept of kindness into everything he did and became an entrepreneur, running several businesses. The family later moved to the United States, and Lubetzky attended Trinity University in Texas. While studying abroad in Israel, Lubetzky came up with an idea for a nonprofit that would use joint commerce to facilitate communication between people in conflict zones, such as those living in Israel and Palestine. 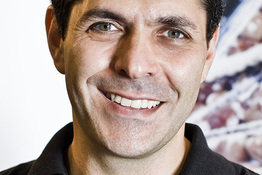 He came back to the U.S., got his law degree at Stanford, and in 1994, founded PeaceWorks, an organization that helps facilitate “peace through enterprise” by forging cooperative relationships between warring peoples; its line of products included a pesto and tapenade made with vegetables from Palestine at a production plant in Israel. In the early 2000s, PeaceWorks was doing well and Lubetzky was traveling a lot and regularly skipping meals. When he couldn’t find a healthy snack to satisfy his hunger while on the road, he decided to found KIND Healthy Snacks. Based in New York City, the company launched with five people and now has 300 employees worldwide. KIND is known as the fastest-growing brand in the nutritious snack food industry, with reported revenues north of $120 million per year, up from around $15 million in 2008. OPEN Forum recently talked with Lubetzky about the early days of the company, his hiring policies and why he wishes he could learn to relax a little more. Your father sounds like an incredible man. Did you become an entrepreneur because of him? My father is certainly the most inspiring figure in my life. The entrepreneurship aspect I think I absorbed through osmosis, from watching him rise from a third-grade education when he arrived in Mexico after the war with nothing but the clothes on his back to a self-educated and kind business leader. My efforts to build bridges among people [with PeaceWorks and KIND] can be directly drawn to my commitment to prevent what happened to my dad from happening again to others. What was it like to launch KIND? It was a tenuous time. I literally stayed up at night worrying whether I would be able to pay my team members’ salaries. I am proud that I managed to never miss payroll, but it was close, and at times it required me to defer my own salary. I learned the hard way about the natural food space and remember formulating our products myself, designing our labels, taking orders door-to-door in New York City and then entering invoices into my computer and delivering product from the trunk of my car. Oh, and the trunk was broken and only closed with the help of duct tape. I’ve read that you rely heavily on references when hiring. Why is that? We are very particular about hiring because every member of our team—what we refer to as family—will literally become a co-owner and shareholder who serves as ambassador of the brand in their daily lives. I do rely heavily on reference checks, not just to evaluate if there is a fit, but as an opportunity to get to know the candidate and really hone in on how we can best set up that person for success. I find that with references, I can learn the person’s strengths and weaknesses and ultimately know more about them before they start. That knowledge then helps facilitate a faster ramp-up period. I understand that practicing self-criticism is an important part of the internal culture at KIND. Why is that so important to you? I’ve always been self-critical and have found that this mindset works well in an office setting. It helps us to continually improve and grow as a collective team. Introspection and self-criticism are among the most essential skills to success, in my opinion. As for our culture, we also focus on transparent communication. Earnest, open dialogue is extraordinarily valuable. We encourage our team to critique ideas and think critically about all the choices we make and the assumptions we tend to have as we reach decisions. Looking back at the last 10 years with KIND, what would you tell yourself in 2004 that you didn’t realize at the time? I would first tell myself, “Relax, it’s going to be fine.” But even if I told that to myself, I don’t think I would have been any less driven. Still, looking back, I sincerely could not have imagined that we’d go this far this quickly, and I do feel that we are blessed and have a responsibility to give back even more as a result. What is cool is that from the valleys where we started, it was impossible to see us grow this far. But now that we are here, we realize this is not the peak. Far from it. We are just getting started, and we have an incredible opportunity to impact society in a very deep way if we continue our plan and keep our values firmly in place.